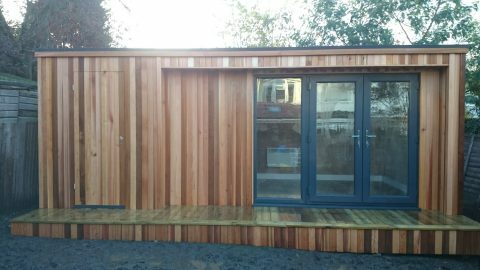 We make beautiful, hand crafted modern garden rooms, garden offices, garden studios and bespoke outdoor garden buildings for year round use . At Modern Garden Rooms, we know that one size doesn’t fit all. That’s why we offer five stunning, architecturally designed garden buildings, each of which can be fully customised to best suit your requirements and personal taste. Whether you are looking to build a light and airy home office to work from, a fully equipped home recording studio, perhaps a home gym, relaxing treatment room or a blissful summerhouse, Modern Garden Rooms’ designers will seek to make the optimum use of the space you have available whilst ensuring that you are happy every step of the way. 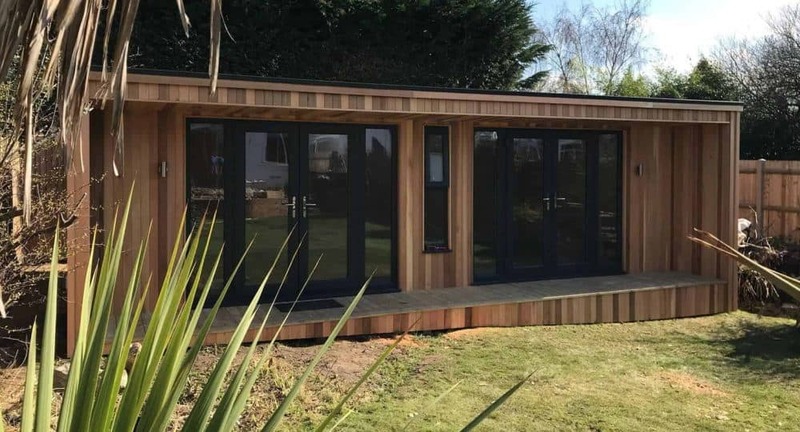 Depending on the space available, we can easily extend your garden room, creating additional space for that extra desk or cross trainer. You can choose from French doors, bi-fold or sliding doors to enhance your chosen garden building. We can re-position windows or doors to maximise natural light, provide space for high furniture or to avoid being overlooked; it’s all part of making you feel at home in your new garden room. Unsure? We offer a free site survey where we will discuss with you all of the options available and any site preparation required before installation. We will then produce a floor plan of your room design, and even a video rendering of what it will look like to go with your no-obligation quote. All of our modern garden buildings are hand crafted and can be installed in your garden at locations across the UK within 4-6 weeks! Installation is included FREE within the price of your new Modern Garden Room. Complete with an integrated decking area which connects your garden room with the outdoors, the Canopy Garden Room is one of the most popular and attractive designs that we offer here at Modern Garden Rooms. Featuring a one metre canopy, complete with downlights to illuminate the building entrance as it gets dark, the Canopy Garden Room has a stunning modern look and is also incredibly versatile. 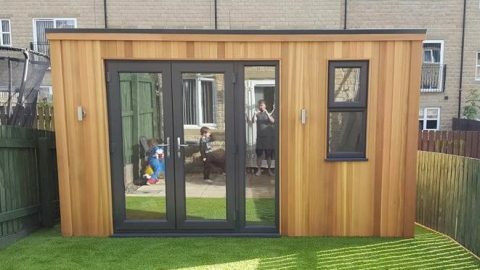 We can build this garden room as small as six square metres for those with smaller gardens, or as large as 50 square metres, giving your family all the extra room you need! Designed to allow plenty of natural light into the room, the Cube hosts a variety of possibilities. It’s the perfect space in which to relax and unwind with family and friends, gather your thoughts alone, or gain inspiration when working or creating. The Cube can be whatever you desire. This spacious design also includes a 1m decking area, ideal for catching the rays on those longed-for sunny days. 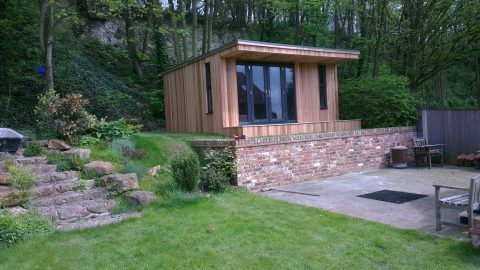 Like all rooms offered by Modern Garden Rooms, the Cube’s size can be tailored to suit your needs. If you’ve always dreamed of having an office garden room, the Cube could be just the solution you’ve been looking for. 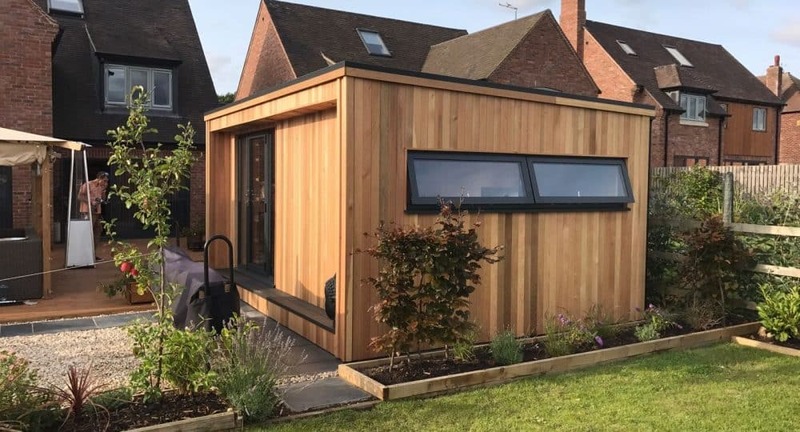 Our Rendered Garden Room is a smart, ultra-modern garden room for those who aren't keen on the classic red cedar timber cladding, and want a sleeker appearance to their home office. 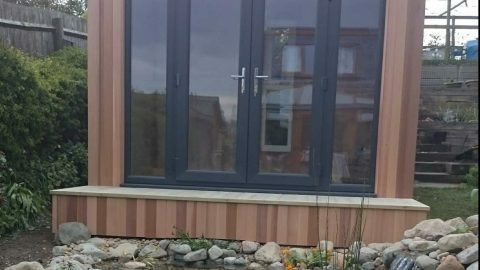 The Rendered Garden Room is available in over 800 different colours, so whatever your spec, Modern Garden Rooms will be able to accommodate you. 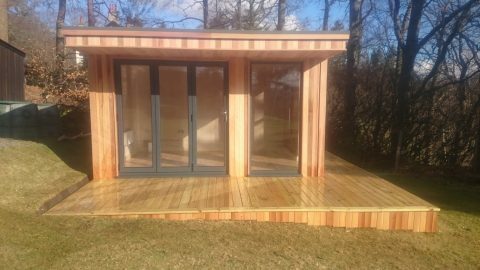 Just like our other garden buildings, our Rendered Garden Room is entirely customisable to your own dimensions. There is an integrated decking area, and if you would prefer a canopy on your building, speak with us! 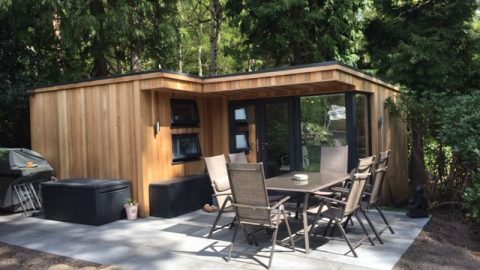 Our Concave Garden Room comes with all of the great features of our Canopy Garden Room, such as the useful downlighting and integrated decking area. 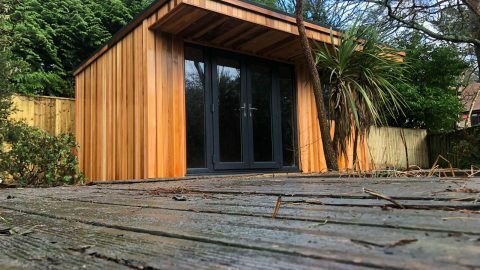 However it is subtly different; the enclosed decking to the sides of the Concave Garden Room transform it into a much more private space, making it the perfect treatment room for your home business. Whether you're looking for a small room or a larger space, the Concave Room offers you a stunning, modern looking building with additional privacy and seclusion. Our Border Garden Room is a luxurious space with a striking powder-coated metal trim surrounding the entrance to the building. The border, which gives this style of garden room its name, is available in white, light grey, dark grey or black. With an optional decking area and large doors allowing the maximum amount of light into the garden building, it is the perfect space for those who want to look out on their beautiful garden. Offering an extremely flexible space, the Border Garden Room can be whatever you want it to be. Here at Modern Garden Rooms, our aim is to give you the garden building you dream of. We create stylish, ergonomic designs which we believe provide excellent value for money. We strive to give you extremely high levels of customer service and performance along every step of the way, so that you can be absolutely confident in your decision to purchase a beautiful and practical new insulated garden building from us at Modern Garden Rooms. 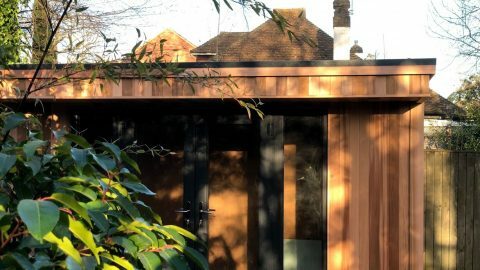 Whether you are concerned about planning permission, or you have an idea that you’d like to make a reality, we would be more than happy to guide you through the process from start to finish as we design, create, and install your new garden office, studio, treatment room, playroom or summerhouse. 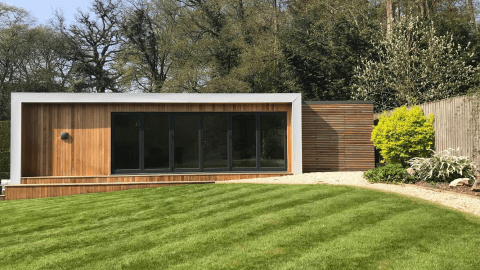 Please feel free to give Modern Garden Rooms a call on 01423 60 30 26, where a member of our friendly team will be delighted to discuss your requirements.